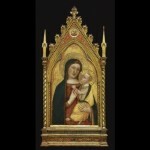 Bernardo Daddi (ca.1280–1348) was an early Italian renaissance painter. 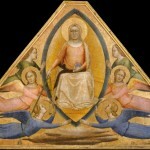 It is somewhat unclear if he was actually a student of Giotto di Bondone (ca.1266-1337). 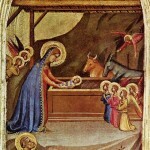 However, it is clear that Giotto influenced Daddi's work. He is thought to be historically important because he might have introduced the Seinese style of painting into the scientific school of Florence. Through his student, Allegretto Nuzi (1315-1373), Daddi also helped to spread the Sienese tradition into Umbria. Daddi, rather than attempt the monumental paintings so in fashion at the time, primarily created small alterpieces and triptychs which many consider true masterpieces. This may have been a clever business decision. 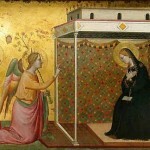 He could spend more time on details within his paintings while producing more pieces to meet the growing demand of private buyers of paintings for their own chapels and homes. At least one art historian mentioned that Daddi was partly responsible for increasing the popularity of hinged triptychs in Florence. The popularity of these portable triptychs was in part because they could be closed to protect the paintings and they could travel with their owners. Daddi and Taddeo Gaddi (1290-1366), during the 1320s and 30s, developed a Gothic format for the panels they used within their triptychs. I found several historical mentions of a daughter named Beatrice. For a time, Spinello Aretino (c. 1350 – c. 1410), a painter who would one day tutor Daddi's son Bernardo, would live with the family in Arezzo. Beatrice was of a marriageable age and Daddi hoped to find her a husband. Beatrice proved patient as it took Aretino some time to realize that he had come to love her. They married. Spinello, Beatrice and Daddi would be in Gaeta when Beatrice was called home to attend her mother who had been “seized with a dangerous illness. Her father would travel home with her. The historian, who tells this tale, focuses more on Spinello than he does on the Daddi family. He didn't provide dates but I suspect the “dangerous illness” was one of the deadliest in human history. Daddi's return to his wife's side most likely led to his own death from the same illness. 1348, the year Daddi died, was one of the deadliest in European history – the peak of the Black Death in Europe. Estimates range from 45 to 80% of the European population succumbing to the plague in the 14th century. A number of prominent and young artists would succumb to the plague. The artist historians refer to the “Assistant of Daddi” is known to have died from the plague and brothers Ambrogio (1290-1348) and Pietro Lorenzetti (1280-1348) appear to disappear from all historical records around that time as well. Their untimely deaths greatly influenced the future of artistic development in Florence and throughout Europe. Ironically, the vacuum, created when so many artists were not around to influence the next generation of painters, freed up the younger artists to develop their own styles, perhaps more so than ever in history. We primarily know that Daddi died in 1348 because of municipal records which mention the dispensation of his two orphaned minor sons, Daddo and Francesco. One can easily infer that if his death meant the boys were orphaned, that Daddi's wife predeceased him. One might also perhaps assume that their daughter, Beatrice, had also succumbed to the plague since she was summoned home to care for her mother, was traveling with her father and does not appear to have been mentioned as a potential care-giver for her younger brothers. Both Daddo and Bernardo would become painters but there appears to be no surviving works that have been attributed to either of them. Daddi had an established workshop. It would appear he developed some sort of financial arrangements whereby his work continued to earn money after his death which provided well for his children. It is assumed that both sons would assist in their father's workshop but there is no true record of their having done so. Beyond a bit of supposition and a few scant facts, there is little known about Daddi's children.